In a news story, which you can read here, it was mentioned that Leo Lowy was a Jewish survivor of Buchenwald, who was sent to France after the camp was liberated. Before he was sent to Buchenwald, Lowy had been a prisoner at Auschwitz, which was the SECOND camp to which he had been sent. The news article did not mention the first camp, to which he was sent, but it was probably the Theresienstat camp in what is now the Czech Republic, since Lowy was living in Czechoslovia at that time. Lowy was 85 years old when he died, so he was probably born in 1929 and was 15 years old when he was sent to Theresienstadt. According to Holocaust history, a total of 44,693 Jews from Theresienstadt were sent to Auschwitz-Birkenau. On September 8, 1943, a transport of 5,006 Czech Jews was sent to Auschwitz where they were put into a “family camp” which was liquidated six months later, when all but a few of the Czech Jews were gassed. There were 22,503 Jews from Theresienstadt who were transported to unknown destinations in the east. At Auschwitz, Lowy was sent to the right by Dr. Josef Mengele because he claimed that he was a “carpenter” and able to work. To the left meant the gas chamber. [Lowy] was left orphaned after his parents became ill and were refused admittance to the [Auschwitz] hospital because they were Jews. Contrary to Lowy’s story, Otto Frank, the father of Anne Frank, was admitted to the hospital at Auschwitz, which enabled him to survive the Auschwitz-Birkenau death camp. Anne Frank also survived Auschwitz-Birkenau because she was sick and was sent on the “sick transport” to Bergen-Belsen, where she subsequently died in the typhus epidemic. After the liberation [of Buchenwald] in 1945, U.S. troops took in the teenager [Leo Lowy] as their “mascot,” feeding him in exchange for chores, and brought him to France. There were 904 children, who were in the Buchenwald camp when it was liberated, and most of them were orphans. 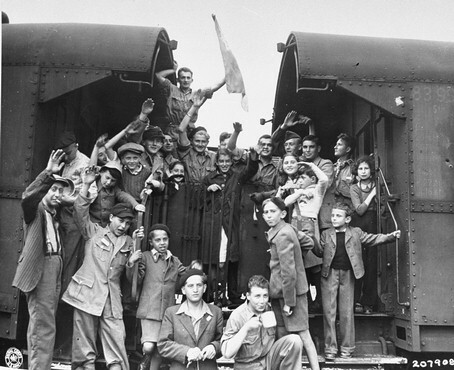 After the liberation of the camp, two American army chaplains, Rabbi Herschel Schacter and Rabbi Robert Marcus, contacted the offices of the OSE (Oeuvre de Secours aux Enfants), the Jewish children’s relief organization in Geneva, Switzerland. 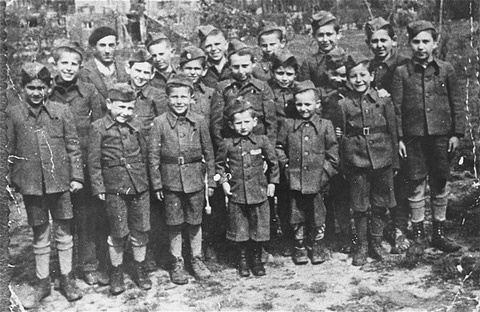 The OSE made arrangements to send 427 of the Buchenwald children to France, 280 to Switzerland and 250 to England. On June 2, 1945, OSE representatives arrived in Buchenwald and along with Rabbi Marcus, accompanied the transport to France. Rabbi Schacter escorted the second transport to Switzerland. Legalienate: What is a skeptic? Schlermer: A skeptic is a person who looks for the logic, reason, and evidence for a claim. Legalienate: This makes you, in general, quite distrustful of conspiracy theories, no? Schlermer: Absolutely. The more elaborate a conspiracy theory is, and the more people that would need to be involved, the less likely it is true. The liar Wiesel story is THE classic story of the holocaust! He was in a hospital, in a camp, which was supposedly part of history’s biggest industrial death machine, recovering after a foot operation. A FOOT OPERATION!!!! The “foot operation” could have been as simple as an operation for an ingrown toenail. The hospital could have been a fake hospital which was really a place to kill the prisoners. Or Wiesel could have been in a hospital at Auschwitz, having his tattoo removed. This could be why he has no Auschwitz tattoo. Elie could have met one of the Buchenwald orphans while he was in France, after the war, and he could have gotten some ideas for his book from the orphans, some of whom were at least 17 years old. This could be why he has no Buchenwald ID number. So tell me why did the Jews end up here in the first place, why where did these “orphan” kids parents end up? Oh never mind they became Santa’s helpers in the north pole. The Jews ended up at Buchenwald because they were marched out of Auschwitz before the Soviet liberators of Auschwitz arrived. Some of the children at Buchenwald were not “orphans” because their parents were still alive and in the Buchenwald camp. According to Danuta Czech, who wrote a book entitled “Auschwitz Kalendarium,” the total count from the last roll call on January 17, 1945 was 67,012 prisoners in all three Auschwitz camps. According to Otto Frank, the father of Anne Frank, the prisoners were given a choice between staying in the camps until the Soviet troops arrived or going on a 50-kilometer fast hike through two feet of snow to the border of the old German Reich where they would be put on trains and taken to camps in Germany. This was a “death march” with those who couldn’t keep up being shot and left alongside the road, including SS guards, according to a survivor. Those who were too young, too old or too sick to march were left behind. The VIP prisoners, a group of famous scientists and intellectuals, were also left behind. Elie Wiesel, the most famous survivor of the Holocaust, was in a hospital at Monowitz, recovering from an operation on his foot, when he chose to join the march out of the camp, and eventually ended up at the Buchenwald camp. The choice was in our hands. For once we could decide our fate for ourselves. We could both stay in the hospital, where I could, thanks to my doctor, get him (his father) entered as a patient or nurse. Or else we could follow the others. “Well, what shall we do, father?” He was silent. “Let’s be evacuated with the others,” I told him. I like how you always act as if typhus aka “camp fever”, “prison fever”, “gaol fever” or “ship fever” was a non-issue during WWII. Until revently, every time a combination of immuno-depression and poor sanitation/hygiene occured, as in wars, prisons, etc, typhus epidemics raged. Typhus was a major issue during and after WWI. Why wouldn’t it have been an issue for the Germans during WWII? During World War I typhus caused three million deaths in Russia and more in Poland and Romania. In Russia after World War I, during a civil war between the White and Red armies, typhus killed three million further people, largely civilians. During WWII, the Germans had no DDT and efficient vaccine as the Americans. The first vaccine widely available was invented in New York by Herald R. Cox in 1938 and used extensively by 1943. Without any efficient vaccine and DDT, the Nazis could only build delousing stations (often using the fumigant Zyklon B) at the entrance of their camps in order to prevent typhus epidemics from emerging in those places as much as possible. It didn’t always work and typhus epidemics sometimes emerged in some of the German concentration camps killing vast numbers of inmates. That was maybe tragic, but that was not the result of any genocidal policy. There exist documentary evidence of Himmler ordering to reduce the casualties in the German concentration camps by any means.